I would like to say a big THANK YOU to the Azbuka Foundation for your priceless contribution. Your grant has enabled my son Artur to have the opportunity to study at Azbuka school for the past three years. In that time he has undergone a complete transformation. His ability to speak, read and write in Russian has improved considerably and he has expanded his vocabulary. When we read books together he always comments on the spelling rules he has learned. His most recent achievement was to come first in the Russian Language Olympiad run by Uchi.Ru. He particularly enjoys tasks requiring knowledge of two languages, and has said that he wants to become trilingual😊 He loves being on the stage at Azbuka and he enjoys drama, music, dance and the art projects, although he had never previously shown any interest in these areas. As a parent I am thrilled that Artur always receives recognition for the effort he makes, however small. It really motivates him and encourages him to do his best with anything he tries. Since the beginning of this year he has been putting that ‘little extra’ effort into his work, to earn himself a star or a ‘Super-Star’! Another recent achievement was the award Artur received for producing the best homework for his project The World Around us. Last year Artur was chosen to serve on the School Council, which was also a great motivator for him. He has become more responsible and discerning in the ways he talks about his school-life. Once again, a HUGE THANK YOU to the Foundation for giving Artur the bursary, and to all the teachers for their care and consideration they show to the children and for their deep commitment to their work. We have been so lucky to be part of the great Azbuka family! Моя дочка ходит в Азбуку совсем недавно, всего три недели, но даже за такое короткое время нам стало понятно какое замечательное место Азбука – ребенок там счастлив. До этого дочка ходила в английский сад и ей там было очень некомфортно и сложно, в основном из за языка (у нас дома только русский). В Азбуке у нее нет никаких сложностей, идет туда с удовольствием и довольная приходит! Парадокс для тех кто не знаком с двуязычной системой, но дочка из Азбуки (садика) приносит не …только новые русские слова, но и английские. Мы переехали в Hammersmith из другого района, чтобы быть ближе к саду и школе. Конечно переезд это было серьезное решение и мы немного боялись и сомневались как все будет. Теперь никаких сомнений нет – мы в восторге потому что ребенок светится. С радостью ждем школу с сентября. Спасибо всему коллективу Азбуки – за три недели мы уже почувствовали себя частью большой семьи! My son started at Azbuka Nursery at the age of 2.5 I really loved the atmosphere, the kindness and professionalism shown by the nursery staff. I had no desire to send my child to an English school at the age of 4. My husband and I seriously considered home schooling but fortunately Azbuka opened its doors and we had not the slightest hesitation in enrolling Sasha. Sasha is now nearly 7 and in Year 2. Like the nursery, the school has a warm, family feel. The classes are small, which allows the teachers to take an individual approach to the children and give them plenty of attention. The education system is brilliantly organised. 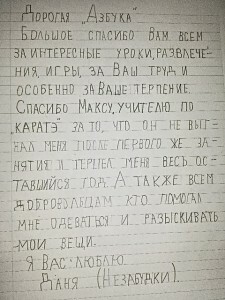 I have seen huge progress in Sasha’s reading and writing in two languages. In the main lessons there are huge elements of creativity, there are even lessons on church art. The trips, to museums, theatres and parks, are also well organised. My son really loves Azbuka and is always very happy to go to school. We are very grateful to all the staff at Azbuka and hope that the school will continue to grow and flourish. We enrolled our 3-year old twins at Azbuka before relocating from Berlin to London. The reasons? Its unique character as the only Russian-English (nursery) school with am increased focus on other languages; its focus on early child development and language learning, which most efficiently happens at a young age through native speakers (to achieve the level of or close to mother tongue); its conviction that behind a language there is a whole culture that offers a new perspective on life and the wider world. All of these approaches are reflected by the dedicated head teacher and staff to whom we are immensely grateful. We would know of no other place where our children would be in equally or similarly good hands. Школа Азбука-прекрасное место для разностороннего развития и раскрытия способностей наших детей. Этому способствует не только уникальная билингвальная общеобразовательная программа, но и интереснейшие занятия искусством, музыкой, танцами, наукой. Так же в расписание включено множество увлекательных экскурсий. Психологическая атмосфера Азбуки удивительна! Дети чувствуют уважение и заинтересованность учителей, и это положительно сказывается на результатах обучения. Мой сын Алексей учится в третьем классе. За прошедший год он значительно лучше стал понимать и говорить по-английски, научился писать по-русски, узнал много нового по истории, биологии, географии, приобрел опыт участия в театральных постановках, нашел друзей. Хочу выразить огромную благодарность коллективу русско-английской билингвальной школы Азбука! We joined Azbuka fairly recently. My younger daughter started in the nursery and my older daughter started in reception in April this year. I have to say that we are getting from Azbuka something that we have never experienced in the UK before. From my viewpoint, the way the class sizes are small in reception (there are currently 6 pupils) and every child is treated as an individual is absolutely critical. The teachers understand my children completely, their needs, their level of development and every step the teachers take is designed to ensure my children develop their full potential. It is not one of those schools where the teachers are totally overwhelmed and demoralised by their work. In the short space of 2.5 months my five-year-old daughter has already begun to read phonetically – in Russian and in English. She dances the tango with a partner and knows Spanish dances that she has learned in her Friday dance lessons. My daughters have broadened their vocabulary enormously in both languages. I am very, very pleased to have discovered the Azbuka school and nursery for my children. It’s like our second family, my children never want to go away on holiday. They run into school with such joy every morning! Thank you very much to everyone at Azbuka for investing your energy into our children, for being so positive and simply indispensable! Мы пришли в Азбуку сравнительно недавно, моя младшая дочь стала посещать садик и старшая дочь подготовительный класс в апреле этого года. Я должна сказать что то, что мы получаем в Азбуке мы не получим нигде в Великобритании. Для меня, маленькие классы в подготовительном классе (6 учеников на данный момент) и индивидуальный подход к каждому ученику просто незаменимы. Учителя полностью знают моих детей, их нужды, их уровень развития, продумывают каждый шаг чтобы мои дети могли полностью развить свой потенциал. Это не школа с огромным количеством детей где загнанные учителя работают без души. За эти короткие 2,5 месяца моя 5-летняя дочь стала читать по слогам – по-русски и по-английский. Она танцует танго в паре и испанские танцы после регулярных уроков танцев по пятницам. Словарный запас на обоих языках улучшился колоссально, у обоих девочек. Я очень очень рада что нашла садик и школу Азбука для своих детей – это наша вторая семья, мои дети не хотят уходить на каникулы. Бегут в школу с радостью, каждое утро! Огромное спасибо всему коллективу Азбуки за то что вкладывают душу в наших детей, всегда позитивные и просто незаменимые! I was very pleased with my son’s (SEND, special educational needs child) experience at the Azbuka nursery. He has really flourished this year in the warm, calm and caring environment. Azbuka’s small size classes and devoted and dedicated attitude of the staff to the children really helped my son to open up, enjoy play time with other kids and grow in all areas. Nursery teachers followed recommendations of my son’s therapists (speech and language, occupational, physio, etc) and psychologists and were very opened and responsive to the implementation of new ideas and strategies. I really recommend Azbuka to all parents as a unique setting with a fantastic team with hugely cooperative approach to work in partnership with parents and to meet individual needs and unlock potential of each child. Another HUGE THANK YOU to chef Victoria for cooking the lovely Russian dishes at school. Russian culture can be sampled on many levels.I would like for Artur to have the opportunity to continue his studies at Azbuka. You’ve kindly offered him a bursary last year, for which we are very grateful, as without your help, this amazing year wouldn’t have been possible. I would like for Artur to be considered for a bursary for the next academic year, please. Our relationship with Azbuka started almost 13 years ago, when my daughter opened a door to Azbuka nursery in Richmond for the first time. Then my middle son joined his sister and finally the youngest brother followed the steps of his siblings. Living in London makes us very fortunate as we are be able to raise our kids bilingual. Without educational centers like Azbuka it would be a very difficult, almost impossible job to do. Azbuka provides safe, nurturing environment for kids to deeply engage in learning a different language. It is organized on a higher level and based on a wider scale teaching plan than it is used as a common practice for learning a foreign language. It opens up a new world, enrich understanding and knowledge of the different culture. It reinforces key values such as respect and tolerance. The teachers / careers combine professionalism with friendly, even motherly approach when required. All of them speak English or bilingual English-Russian professionals, what is very helpful in keeping the communication on the childs development flowing with the parents who do not speak Russian. The classes are very small. It helps to provide individual attention if a child is struggling in a particular area. The teaching is enriched with exta lessons such as history, geography, science. Kids are taken out on interesting supervised trips. Azbuka is a good opportunity for siblings to spend educational time together, In our world of classes based on the age structure, it is very easy to go to the same school but not to see your sibling until the weekend. At Azbuka special time is dedicated for activities of mixed age and ability. In addition to the language our kids learn how to deal with younger child or being inspired by an older schoolmate. Azbuka administration regularly shares news in the bilingual education to parents, provide support and guidance on how to continue the education at home. There is a good library of Russian books available on site or to borrow for all ages of readers. There are strict rules such as no food with nuts etc as at any school. They are regularly communicated to the parents and kids. There are some teachers who are going above and beyond what is expected for a standard teacher. I strongly believe that their innovation and experience should be shared with other bilingual schools. Examples would be the use of new technology, arts and crafts in engaging kids to cover difficult subjects. As aside I would like to add that the majority of the kids go to academic local English schools, where they continue to perform very well despite allocating a big slot of time for the learning of a different language. Azbuka will make an impact on pupils life beyond the current generation as well as will contribute to UK labour force becoming more competitive in the world market by bringing up intelligent billingual tolerant, creative people equipped to face new challenges. My 8 year old daughter attended the AZBUKA Russian nursery when aged 3-4 years old. She has subsequently attended the Saturday school, where she has participated in both academic and non-academic lessons. Her primary language at home is English but by attending Azbuka, she has developed a high competence in all fours aspects of the Russian language – reading, writing, listening, speaking, as well as an excellent understanding of Russian culture and history. This has been achieved through various academic projects involving the children, but also through extra curricular activities like dancing, art, music as well as educational trips, and an annual camping trip with children and their families. I am extremely grateful to Azbuka for providing the opportunity for my daughter to grow up in this diverse and bilingual community with children of all ages. In my view Azbuka achieves an academic excellence whilst instilling a sense of pride and belonging as part of both British and Russian cultures. I would like to express my deep gratitude to everyone at Azbuka for their professionalism, enthusiasm and genuine compassion. My son Artur only recently started at Azbuka but in just a few weeks I have seen a big difference in him. He has started to speak Russian with greater accuracy, he has begun to enjoy dancing, drama/role-play and music. Children absorb Russian and English culture through games and entertainment. Although we only talk in Russian at home, Arthur is still more inclined to speak in English as he went to an English nursery for two years and the reception class of an English school. Azbuka is helping him to strike a good balance and develop his Russian to a far higher level. After his first day at Azbuka he said he loved being there and didn’t want to go to his old school any more. It’s the teachers at Azbuka who should take credit for this. Because every child in the class is treated as an individual, he or she develops not to a level that is regarded as the ‘statistical average’, but in line with his or her individual abilities. Artur absolutely loved the trip to the Transport Museum and to Kew Gardens. Once again, a huge thank you goes to Maria Gavrilova, Yelena Rosenberg and Sasha Williams for their dedication to their work and the attention and warmth they show to Artur. Хотелось бы выразить огромную признательность коллективу Азбуки за их профессионализм, увлеченность и искреннюю заботу. Мой сын Артур начал посещать Азбуку совсем недавно, но уже за эти несколько недель я вижу разницу. Ребенок стал чище говорить по-русски, ему стали нравиться танцы, драма/инсценировки, музыка. Русская и английская культуры преподносится детям через игру и увлекает их. Хотя дома мы говорим только по-русски, Артур все-таки больше склонен говорить на английском, так как 2 года посещал английский детский сад и Reception class в английской школе. Азбука помогает ему найти баланс и подтянуть русский на гораздо более высокий уровень. В первый день он сказал, что очень любит Азбуку, потому что там интересно, а в старую школу он больше ходить не хочет. И в этом заслуга учителей Азбуки. Ведь когда в классе индивидуальный подход к каждому ребенку, то и уровень развития детей будет не “средне-статистическим”, а по способностям каждого из них. Артуру очень понравились походы в Музей Транспорта, в Kew Gardens. Еще раз огромное спасибо Марии Гавриловой, Елене Розенберг и Саше Вильямс за их любовь к своему делу, внимание, которое они уделяют Артуру и сердечность! After completing 12 years of education at Azbuka, I am currently in my 3rd year of being a member of the Azbuka working team volunteering as a teaching assistant and getting a very good work experience at a bilingual school. In one sentence – it has been my absolute pleasure. Growing up in a bilingual family, it’s lovely to also work in a bilingual environment, where all cultures and nationalities are appreciated not only be the staff, but by the parents and children of the school too. In terms of the work environment, I found it to be very safe. The health and safety, pupil behaviour and discipline, sick child and emergency school policies (to name a few) were explained and presented to me by the management from day one. Azbuka’s advice has been easy to follow and included practical options and has helped me avoid any problems. I know that myself as a member of staff and all the children are really safe at Azbuka from the time that we enter the building to the time we leave and this is a really important thing to me. Every child is always supervised and with a member of staff at all times which not only is important safety-wise but it means that the children get an amazing quality education at this school. All of my three children attended Azbuka Nursery and all of them loved it. And we, as parents, loved it too. Kids are always engaged into very creative activities with different materials and themes, learn lots of topics, build friendships and generally feel very very happy. Teachers create an amazing warm and welcoming atmosphere and kids establish a really strong bond with them. Overall Azbuka boosted a lot my children’s development and confidence and gave a great foundation for their future life. I would like to thank all members of staff for the love, care and support they gave to us. I visited Azbuka bilingual school on Friday February 24, 2017 to observe classes as part of my role as Trustee. I was Reader in Educational Studies at Goldsmiths, University of London, specialising in research on bilingual learning, until my retirement, and have advised on curriculum planning for Azbuka. I was impressed by the excellent variety of materials available in each classroom, in both languages, to support children’s learning. There were also materials made by children themselves, showing the breadth of the curriculum in arts, science and humanities as well as language, literacy and mathematics. For example, I witnessed a dance lesson conducted in Russian, and children writing about cultural celebrations that had recently taken place. I saw lessons in Russian and others in English. In both cases, teachers adapted the activities to individual children’s level in each language, so that tasks were manageable but challenging. All pupils were enthusiastically involved in their learning and parents collecting their children commented on how much they enjoyed coming to school. The bilingual curriculum has been carefully planned to ensure progression in both languages and seems to be working well. The children are benefiting from two languages and cultures which gives additional breadth and depth to their learning. Миф о том, что человек по своей природе одноязычен, а билингвизм замедляет языковое и когнитивное развитие ребенка, был опровергнут еще в 60-х гг. прошлого века, и сегодня сложно встретить родителей, которые бы сомневались в преимуществах воспитания сбалансированных билингвов. Вокруг нас разлит океан информации об особенностях раннего развития в двуязычной среде, а в нашем арсенале – бесконечное множество средств, обещающих помочь сохранить владение языком семьи у следующего поколения. Однако поддержание двух языков становится действительно непростой задачей, когда ребенок начинает ходить в reception class британской школы, где русский язык и русская культура никому не знакомы, а значит, не представляют для него ценности. Взрослые могут воспринимать образование на английском языке как препятствие на пути к достижению своей цели, а в английских учителях видеть более удачливых конкурентов, которые, словно сказочные крысоловы, безвозвратно уводят детей из русскоязычного оазиса, с таким трудом возводимого в стенах дома. Верным решением в подобных ситуациях становится создание вокруг детей альтернативной среды, в которой русский язык бы превратился из секретного кода, знакомого только близким родственникам, в полноценное средство взаимодействия с окружающим миром. Такой средой для двуязычных детей становится билингвальная школа. В ноябре 2015 года я приехала в Лондон из Европейского Университета в Санкт-Петербурге для написания магистерской диссертации по лингвистической антропологии, однако меня интересовали не только языковые практики учеников и учителей, но и методика преподавания, планы и темы занятий, где отражается ориентация на русскую культуру, а также реакция детей на преподносимый им материал. Мария Гаврилова, директор билингвальной школы «Азбука», с энтузиазмом приняла мое предложение к сотрудничеству и позволила мне не просто понаблюдать за жизнью школы со стороны, но принять активное участие в учебном процессе. Прежде чем оказаться там, я посетила в Лондоне не одно учреждение, ориентированное на поддержание русского языка, однако, по моему мнению, «Азбука» представляет собой поистине беспрецедентное явление. Методика, выхолащивающая жизнь из языка и насаждающая его лишь в виде формализованной системы, изобилующей грамматическими правилами, в стенах этой школы заменяется стимулированием учеников использовать язык как средство взаимодействия с окружающим миром. Отказываясь от насаждения моноязычия, преподаватели «Азбуки» не видят в билингвизме учеников проблему: особенности детей, связанные с взрослением между двумя языками и культурами, становятся эффективным средством обучения. Проведение параллелей со знакомыми детям реалиями, предложение заданий на перевод, включение в занятия элементы обеих культур – все это приводит к тому, что дети начинают говорить по-русски по собственному желанию, а не по принуждению взрослых. Разумеется, гораздо проще было бы попросту ориентироваться на российскую систему школьного образования, перенося ее со всеми плюсами и минусами в иной контекст. Я неоднократно наблюдала, как учителя русских субботних школ пытаются апеллировать к фоновым знаниям, которых у детей, растущих в Великобритании, попросту нет. «Консервация» русской культуры, создание ее идеализированного образа и обращение к прошлому в поисках того, что бы пробудило чувство национальной гордости – все это свойственно людям, оказавшимся вдали от исторической родины. Данный подход применяется и в обучении языку и культуре меньшинства, однако так ли он эффективен, если учесть, что ребенок в английской среде имеет опыт взросления, отличный от того, который получили его родители? Он увлечен тем, что связано с жизнью, которая его окружает, и испытывает потребность социализироваться и чувствовать себя «своим» в новом окружении. Пробудить у детей неподдельный интерес к наследию страны, которая им не знакома, – настоящее искусство, и в «Азбуке» им в совершенстве овладели: достаточно посмотреть на завороженные лица детей, обращенные к учителям; услышать их смех, заполняющий коридоры во время перемен; увидеть, с какой радостью они бегут на урок. Добавьте к этому увлекательные темы занятий, которые не обходятся без игр, научных экспериментов и творческих заданий; работу над проектами, заставляющую детей нестандартно мыслить и работать сообща; регулярную организацию всевозможных культурных мероприятий и встреч с русскоязычными писателями, актерами, художниками, музыкантами. «Азбука» – это не просто школа, это мир, в котором у билингвального ребенка наконец появляется возможность выразить себя, осознать, что его мультикультурная идентичность делает его жизнь красочнее и богаче. Я искренне благодарна директору и преподавателям «Азбуки» за предоставленную возможность заглянуть в их творческую лабораторию. Я с сожалением покидала стены этого напоминающего сказочный замок здания и очень надеюсь, что наше сотрудничество только начинается. Искренне желаю школе успехов и процветания! The joy of learning that our 4 year old son wants to go to school was simply overwhelming. He started Reception year in September 2015 at Azbuka school in Mortlake and after the first term break he was so keen to go back to school that the night before the first day of the second term a miracle happened – he for once behaved as a responsible adult and went to bed without even a hint of trying to sneak out of it. Several months before that, my wife and I had no problem with making a decision to apply for a place at a school that didn’t even exist at the time – in fact, it didn’t even have any premises to call itself a school. However, the thesis behind the proposition – a fully bilingual education in English and Russian following English curricula – was strong and unique enough for us to take chances. Then followed a series of pleasant surprises: school building turned out to be in a converted church, which previously had been a host to a school – with all necessary modern fixtures and fittings tastefully contrasting with original church features, an abundance of open space and a variety of kids’ accessories. Teachers and managers turned out to be not only as a dedicated, determined and highly qualified team of professionals, but also interesting and nice individuals. Daily studies and activities are varied, engaging and creative. The whole environment inspires and encourages learning. То, что вы просто есть – уже настоящее чудо. Уютный, теплый и по-настоящему душевный дом русского языка и русской культуры для наших малышей. Здесь интересно, познавательно, весело и очень безопасно, ведь детки находятся в руках настоящих профессионалов своего дела, которые о детках в Азбуке говорят, как о своих родных, и заботятся о них точно так же! Мне повезло получить бесценный опыт двухнедельной практики в Азбуке в рамках моего курса “Преподавание в начальной школе” (Postragraduate Certificate in Primary Education) в UCL Institute of Education в Лондоне. Спасибо всему коллективу Азбуки за то, что они творят чудеса каждый день! Дорогие ученики русской школы «Азбука»! Мы, дедушка и бабушка Элли Ховард, хотели бы сердечно поблагодарить всех вас за чудесное школьное представление, которое было подготовлено в честь окончания учебного года 2013-2014. Увидеть волшебную сказку «Волк и семеро козлят» в Лондоне?! It is too good to be true! Это было потрясающе! А какие замечательные басни были разыграны учащимися! Хотелось бы особенно отметить музыкальное сопровождение всего спектакля. Классно! Высокопрофессионально! Очень радостно! Как каждый человек уникален, так и каждая школа имеет свое собственное лицо. Некоторые берут названием, некоторые мощным пиаром. А школа «Азбука» во главу угла поставила высокий уровень профессионального мастерства своих педагогов и предоставляет своим учащимся эксклюзивные программы обучения, направленные на развитие у детей интереса к учебе, чтению, искусству. Мы можем судить только по своей внучке Элли, которая очень любит ходить в вашу школу. Но на выпускном вечере нам посчастливилось пообщаться с родителями других учеников и с самими учащимися. С этими счастливыми ребятами, говорящими на двух языках, которые принимали участие в спектакле-мьюзикле, где они пели, танцевали, играли на сцене! И именно они говорили о своей русской «alma mater» в превосходной степени! Чувствуется, что у школы «Азбука» есть четкая позиция: педагогический коллектив верит в то, что делает. От школы действительно много пользы – в ней царит настоящая творческая, радостная атмосфера. Мы поняли, что учителя во главе с директором Машей Гавриловой претворяют в жизнь красивую и очень нужную образовательную программу в UK по изучению русского языка. Очень хорошо, что в школе уделяется особое внимание воспитанию бережного отношения к богатому наследию и обычаям русского народа. Наша внучка говорила раньше на русском языке с акцентом. После года обучения в Азбуке, она стала говорить на чисто русском языке и стала такой рассудительной! Ведь язык крепко связан с мышлением. Чтение формирует мысль. Я, как филолог по образованию, считаю, что литература и язык – это предметы человекообразующие, которым надо уделять особое внимание и благодаря которым учителя создают слой мыслящих людей. Именно это заставилo меня сесть и написать свой «отзыв» о незабываемом дне, который мы провели в школе Азбука, и, который оставил добрый след в наших сердцах. Значит, дорогие учителя, все, что вы делаете, не зря! Мы с Виктором Алексеевичем, дедушкой Элли, желаем всем счастья и здоровья, хотим пожелать всем стремиться к знаниям, открывать, творить и созидать доброе, нужное людям! Azbuka’s Foundation Spring Fair for the Wider Community took place in its premises, the spacious, airy hall of a former church on Vernon Road. It was a colourful, bustling affair, with a profusion of Russian artefacts and home-made foods, performances, and various children’s activities. Stylish hand-painted cushion-covers, quirky prints and illustrations jostled with rows of children’s books and of pots of Lithuanian honey set out in graded tones of amber; there were lavish displays of golden loaves of bread, and piles of pirozhki and vatrushki. Russian scarves in vibrant colours and patterns lent a picturesque look to the event. Children ran around excitedly, switching effortlessly between Russian and English, as if it were the most natural thing in the world. Azbuka has come a long way since it was set up by Maria Gavrilova back in 2001, as a club to promote bilingualism in Russian and English. Finding it back then was pure serendipity for us – we happened to live near St. Stephen’s Church in Twickenham, where the first Azbuka nursery was based. My son (now 16) was in the first cohort, and though he only attended one day a week, the Azbuka sessions allowed him to learn the language and absorb cultural references in a natural way – a crucial factor in ensuring a child assimilates a language as a native. He was exposed to Russian songs, stories, games and traditions, which went beyond mere language learning. The place was bursting with imaginative games; I particularly remember a gigantic red felt bus, made specially for the school by seamstresses in the Baltics, and a smiling violinist who would play to the children on demand. Christmas and Easter were celebrated with genuine costumes, traditions and food – and a real sense of fun. Beyond the sessions, it was a true hub for families with a Russian connection. АЗБУКА изменила жизнь нашей семьи. Здесь, в АЗБУКЕ, наша дочь не только узнала много нового о культуре и традициях ее исторической родины, не только научилась свободно общаться по-русски, но и нашла много замечательных друзей среди одноклассников и учителей АЗБУКИ. Мы же, родители, встретили здесь единомышленников, которые так же как и мы, находясь далеко от родины, стремятся сохранить и передать своим детям ее язык, историю и культуру. I decided to support this project as a trustee because I strongly believe in bilingual education. Bilingual education is a great advantage to children. It develops their thinking skills in both languages, keeps them in touch with family and heritage, and helps them grow up confident in their bicultural identities. I congratulate AZBUKA on the excellent work they are already doing, and I wholeheartedly support their plans for the future. I support AZBUKA’s methodology in introducing Russian language to children. Its lively and active engagement does allow to relate many experiences of both English and Russian worlds. Also it keeps language alive and reflects modern life in England. Мы здесь, в Лос Анжелесе очень скучаем по АЗБУКЕ. И по большой и по маленькой. Дети вспоминают и просят найти такую же русскую школу здесь. Театр, танцы, рисование и вся методика АЗБУКИ, построенная на языке и грамоте через игру и творческий проект (а не только учебник) – это огромное погружение. Нам его очень не хватает. Лика и Макс вдруг стали говорить между собой по-английский, а в Лондоне говорили по-русски. Вот так. I was thrilled to discover AZBUKA nursery a couple of years ago. My husband is Russian but because we live in London we were worried that our children could become completely Anglicised. AZBUKA has developed not only their Russian language but also culture, through songs, fairytales and stories. We are so grateful to the huge gift AZBUKA is giving our children. Замечательно то, что обучение русскому языку в “АЗБУКЕ” происходит через творческие занятия: танцы, музыку, искусство, театр и игру, которые так близки и интересны детям по своему строению и духу. Детям нравится ходить в “АЗБУКУ” из-за насыщенности занятий, из-за возможности увидется со своими друзьями, и попробовать сотворить вместе что-то новое, ведь в “АЗБУКЕ” мы так часто воплощаем в реальность новые идеи, задумки и проекты, в том числе и детские. В “АЗБУКЕ” очень приятно и легко работать, ведь каждый преподаватель большой любитель и ценитель своего дела. АЗБУКА – уникальное место. Много ли вы знаете детей, которые хотят ходить учиться по субботам, после целой недели в английской школе?? Сохранить язык, живя далеко от России, особенно в смешанных семьях, очень тяжело. Не успеете оглянуться, а собственные дети уже отвечают вам исключительно по-английски и не очень понимают собственных бабушек и дедушек. We have many happy memories from AZBUKA, which Lillian attended between the years of 2003-2006. We were lucky enough to witness how this small and homely Russian nursery club grew into a well managed, bilingual language establishment that it has become today. A fun and caring environment, friendly and creative staff, complete immersion into Russian language, culture and history – all contributed to our daughter’s early development and bilingual skills which she uses today, so many years later! I believe it is very important to give your child the opportunity to be immersed in a second language when the primary language is so dominant. AZBUKA developed a method which helped us built a solid foundation of vital knowledge our daughter was able to use and expand on. Thank you AZBUKA, keep up the good work! – Мама, а когда я в Москве, я турист или я дома? – А ты как думаешь? – спросила я ее. И от этих слов мне стало тепло и уютно, ведь “дом” – это там, где нам хорошо и комфортно, и чувствовать себя дома в двух странах – высшее достижение двуязычного воспитания и образования. И, если честно, этого сложно было бы достичь только своими силами. АЗБУКА сыграла огромную роль в воспитании, образовании и развитии моих детей. Уникальная программа погружения действует безотказно. Она была разработана АЗБУКОЙ и основана на лучших современных методиках и идеях. Дети погружаются в мир русского языка с помощью структурированных игр и занятий, а не формальных уроков. Чтение, письмо и устная речь преподаются в интересной интерактивной форме. Художественные и научные проекты, спектакли и концерты, клубные мероприятия и школьные поездки дают возможность детям активно использовать свой русский язык. Они читают, пишут, говорят – они живут на русском. И, самое главное, им это нравится! Каждую неделю мои дети ждут приближения субботы и АЗБУКИ, как праздника, а сын считает «денёчки». И я недавно осознала, что у моих детей появился еще один «дом», где им хорошо и комфортно, и этот дом – АЗБУКА. I’m involved with the Foundation because I believe bilingual education is central to better preparing children for the modern world; and because of our son’s own very positive experience of AZBUKA in learning Russian while having fun. “АЗБУКУ” отличает атмосфера творчества, кипучей деятельности, радостной открытости новым идеям. В школе собрались преподаватели разного возраста, но когда находишься среди них, почему-то возникает ощущение, что все молоды. Видимо, потому, что взрослым удается быть на одной волне с детьми, чувствовать и принимать их интересы и строить занятия в соответствии с с тем, что волнует наших детей именно здесь и сейчас, а не с тем, что написано в официально одобренных методичках. Думаю, это лучший подход к изучению языка. I applaud the initiative shown by the AZBUKA group in offering a Russian-English based education. AZBUKA has now joined the growing numbers of schools that have recognised the cognitive, social and cultural benefits to be gained from a bilingual education. Their initiative will strengthen UK-Russian understanding, be to the profit of AZBUKA pupils and their families, and on a broader scale will undoubtedly support UK economic development. In other words this school has the potential to be something very special. Marc Wolstencroft retired Headteacher of Wix the first state school in England to offer a French-English Bilingual education, consultant, supporter of AZBUKA Foundation. Я почувствовала огромную радость и облегчение, когда открыла для себя “АЗБУКУ”: теперь мои дети могут регулярно “окунаться” в русскую среду и через игру постигать этот прекрасный язык! Преподаватели “АЗБУКИ” – интеллигентные и творческие люди, и мои дети с энтузиазмом идут в “АЗБУКУ”. Мне также нравится, что вместе в приобщением к русской классике (русские народные сказки, сказки Пушкина и тд), в АЗБУКЕ активно используются современные ресурсы, например, книги и песни Андрея Усачева, современные детские фильмы и др., и мои дети могут активно поддержать разговор со своими сверстниками из России. The proprietor’s clear ethos for the setting, and strong commitment to promoting children’s Russian language and supporting their bilingualism, is reflected in all aspects of the care and education the setting provides and the manner in which parents and carers are supported. This promotes good relationships with parents and carers, resulting in children settling easily and feeling reassured. Parents praise the proprietor and staff, commenting on how well the staff interact with children, and the support provided to families. Parents state their children are very happy at the setting and comment on how well children are progressing and how their Russian language is supported. 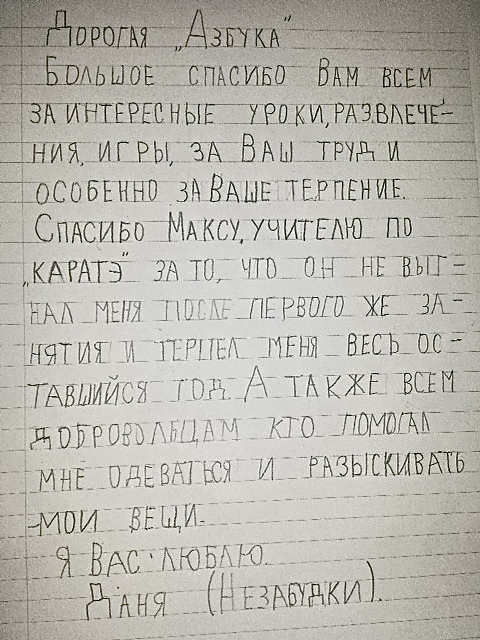 Мы гордимся тем , что наша 13- летняя дочь продолжает говорить , писать и читать на русском ,а так же познавать культуру и историю России благодаря увлекательной, интересной программе обучения русскому языку в АЗБУКЕ с двух лет! My son and my daughter started Russian bilingual school-nursery ‘AZBUKA’ when they were four years old, first at nursery then at school. They enjoy participating in studio work and play productions. They like spending time with their bilingual friends. There is always something imaginative and new going on at school. Здравствуйте дорогие воспитатели АЗБУКИ! Хочу выразить вам огромную благодарность за вашу работу, за ваше отношение к детям, за то, сколько любви и заботы вы вкладываете в воспитание и образование наших деток. Я, находясь далеко от своих внуков, теперь, когда я побывала в Азбуке, очень рада, что у моих внуков есть столько друзей больших и маленьких, которые вместе с ними познают мир, изучают русский язык и культуру и учатся дружить. I am writing to hugely thank you for the bursary you awarded the Azbuka Foundation to support my child Aanyah’s nursery/school placement for last and this year. I am a Ukrainian Born Russian but raised in England since I was 6 and am now 29 so of course Russian is my mother tongue but unfortunately I have not been taught it in this country as my single parent mother could not afford the privilege of sending me to extra Russian tuition or a Saturday school, which resulted me in not being very fluent in Russian and at times I feel very embarrassed as I can not explain myself freely in Russian as I think in English and it comes as my first language even though its not. To me it was extremely important for my child to learn and know Russian as it is part of her roots, but unfortunately the story has repeated itself and I too as a single parent with 2 small children can not afford to send her to learn Russian privately, but was adamant that I somehow have to have faith in God and believe that he will make it possible for me. On this case you are my answered prayer/ miracle as through you it has been possible for me to send my child to the absolutely fantastic and much loved by my child Azbuka nursery and school. We are ever so grateful to you as this opportunity will change my child’s life forever. She will now learn a language that really should be her mother tongue but unfortunately due to the situation has somehow become a second language due to being in UK. Still being a bilingual school its means both the languages are becoming her moth tongues, which is amazingly fantastic. I am ever so proud to know that my child is actually in an independent Russian-English nursery and will perhaps if God keeps blessing me will be taught in a Russian-English school even next year and perhaps for as many years as possible. This opportunity is also helping me improve my Russian and that is very emotionally important to me as all my family are back home in Ukraine and when I used to go there as a child and even a few years ago I had a communication barrier as I could not explain much in Russian and they fully dont understand a word of English apart from “hello”, which wasn’t very helpful! So i felt like I didnt even belong there and it made me very upset for years now I know that my child will never feel like that as she is being taught it from young and it will be instilled in her to speak the language and I too am improving mine especially, as the teachers at Azbuka are so understanding that they help me and even get me involved in activities to get me mixing with Russian people. My child now is able to speak to my family members in Ukraine on the phone and on skype and it makes us all so happy. We are all very grateful to you, even my family back home are always praising yours and Azbuka kindness. I dont think I could thank you enough. I sincerely appreciate you kindness.